Bring 2 tablespoons butter, the pair slices, 2 tablespoons honey and the lemon juice in a large saucepan over medium-high heat, stirring until sugar dissolves. Reduce heat to medium and simmer until pears are very tender, turning occasionally, about 20-25 minutes. Let cool. Pulse together flour, sugar, salt and lemon zest in the bowl of a food processor. Add butter chunks and pulse until the mixture resembles a coarse meal, then pulse in the egg. Add the water and pulse until moist clumps form. Depending on the humidity where you are, you might need to add an additional teaspoon or two of ice water. Spread a rectangle of plastic wrap on your counter and dump your crust there. Gather it into a ball, then flatten the ball into a disk, wrap in plastic and refrigerate for at least 30 minutes. Increase the oven temperature to 450 F degrees. Sprinkle the counter with flour and roll the dough to a rough 14" round. Transfer to the back of a lightly floured cookie sheet, or to a well-seasoned baking stone. Arrange the sliced pears in a spiral pattern, leaving a two-inch border. 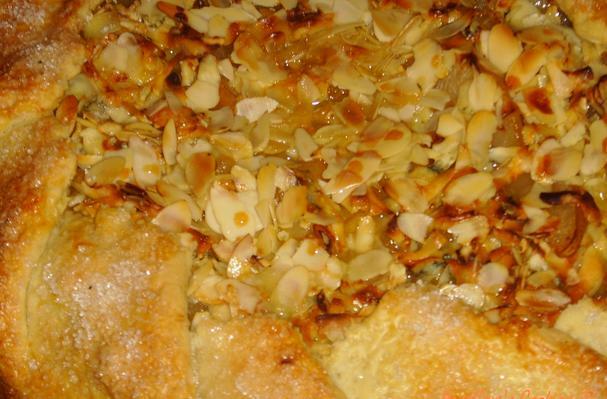 Drizzle with honey, scatter the bleu cheese well and sprinkle liberally with almonds. Brush the border with the beaten egg white and fold the edges up to create a rustic crust. Brush the outside with egg white and sprinkle on the turbinado sugar. Bake for 30 minutes on a baking sheet, or closer to 40 on a stone. I have found the challenging combination of pears, blue cheese and almonds, baked with honey, so particularly tempting that I have felt like immediately indulging in this so irresistible culinary frivolousness. Adapted from Lauren Bracey: "Pear and Bleu Cheese Tart, Easier than Pie"